Tattoos are drawn with specific meanings. While some are commonly applied by anyone, others are specifically applied by a certain group of persons. For instance, the baby tattoos are specifically applied by parents. It can either be the father or the mother, but you will rarely see any other person with these tattoos. These tattoos have a special meaning, which is why they are not exactly applied by everyone. The tattoos of babies are very adorable, especially if they are drawn by a professional. Also, if the tattoo features the face of a baby, it will look more elegant and attractive. Generally, babies are precious gifts and they will mean the world to a parent. They are usually put close to the parents’ hearts, both literally and figuratively. For that reason, a parent would apply the tattoo of the child as a way of putting them in their lives forever. The exact meaning of the tattoo will depend on the placement and the tattoo itself. If the baby is drawn while sleeping it could mean that the child will rest on the parents care forever. There can be some tattoos that show the footprints of the baby. These tattoos might be used to show that the parent will walk with the baby for the rest of their life. There are also some special tattoos like one for a baby devil. Even though this might seem adorable, some believe that such a tattoo will have an evil or a dark meaning altogether. There are also tattoos for a baby angel, which can be used to symbolize a spiritual connection. They can also be used to show that the angel is praying for that person. The baby angel might be drawn while praying. There are some that are drawn to commemorate the death of the baby. Others can be drawn to show a baby still in the womb. This one might be used to welcome the baby into the world. Also, it could be used to symbolize support of the pregnant woman by the partner. Here, the father of the child is the one who would apply the tattoo. Some tattoos will be used to show full support to the baby, especially if the baby has a disability. Such tattoos can have some special words that are composed by the parent. The placement of these tattoos will be general and they can be placed anywhere. Nonetheless, their special meaning makes them be placed only in specific areas. In most cases, you will find the tattoo of a baby on the chest and the arm for men. For women, the tattoos can be applied under the breast or it can also be on the breast. This is mostly meant to show the total care since the baby will always be breastfed. The woman can also apply the tattoo on the arm and on the laps. In some rare cases, some people apply the tattoos on their faces. There is no any restriction on the placement of these tattoos, but they are mostly drawn in a place that is close to the heart. With the availability of different specialists of the tattoos, there will be different types of the tattoos of babies. Basically, these tattoos will either entail the complete picture of the baby, or they can entail a part of it. For instance, there can be the tattoo of a baby’s face or the footprints. For the face, it can entail more details like coloring and the 3D aspects. This will need you to find a professional to draw the tattoo. The footprint will be basic, but it is more painful compared to the other types. It will be filled with a single color and can be included with some words. Also, it could be some initials of the baby, which can follow with a face or footprints of that baby. Some will also have a baby, who is playing with something. Such tattoos will need to be applied in areas with more skin. Also, you must find a professional to advise you on the best way to go about it. That said, here is a look at some of the types of the tattoos of a baby. This is a baby angel that looks so adorable. It can be used to show that the baby is trying to understand the world and its ways. It can also be used to connect the person to the spiritual world. This one can be applied to show that the parent is linked to the child and that the child will follow in the footstep of the parent. 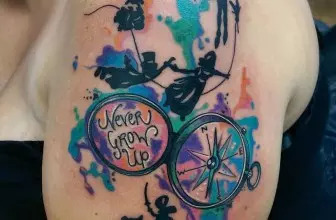 This tattoo can also be applied to show that the parent will walk with the child throughout their life. Such tattoos are mostly drawn by men. However, there are some footprint tattoos drawn applied the mother to the feet. 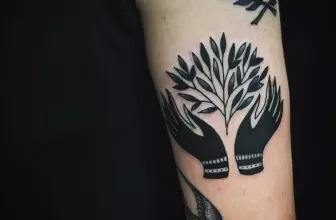 This tattoo can be applied to signify the peace that the parents get when the child is born. This one will be used to commemorate the death of the baby, especially if the baby was still young. 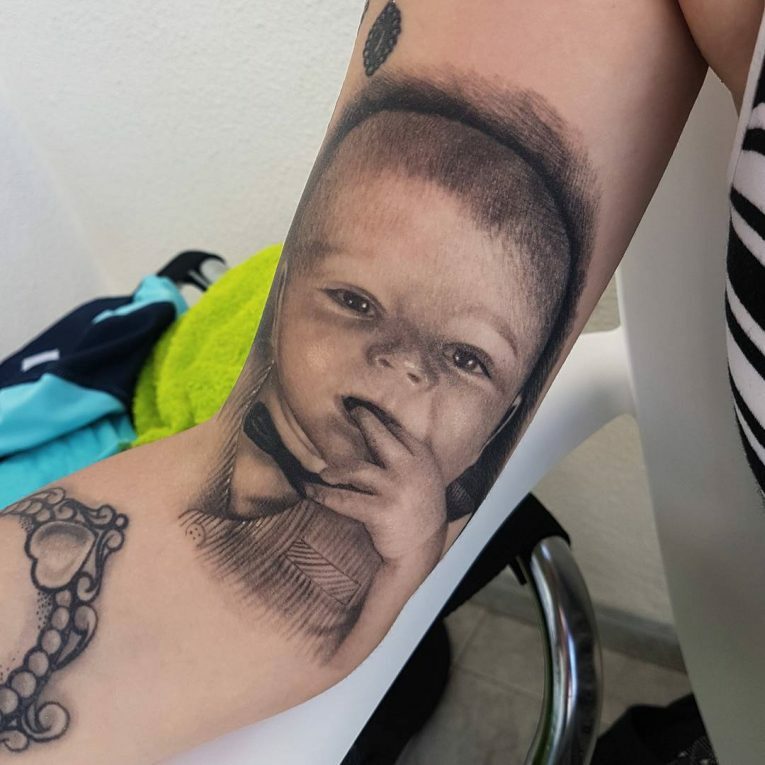 There can be some special tattoos that will be used to show that the baby will develop to be that kind of professional. For instance, there could be a tattoo with the words, Future Rockstar or Future Doctor. These tattoos are mostly applied by the men, who want their babies to follow their career. 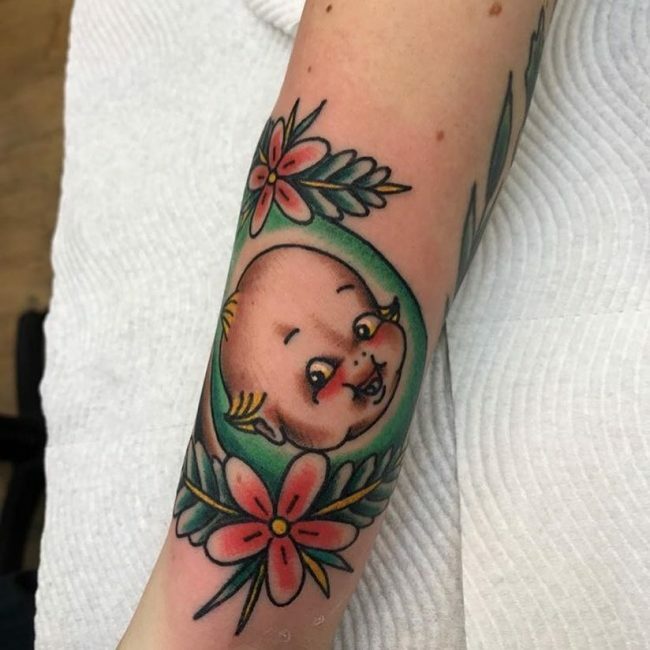 You can also have the tattoo of a laughing baby, which is used to remind the parent of the joy that the baby has brought into their life. Generally, you will find different types of the tattoos of a baby, which are designed in different ways. There can be some tattoos that are applied with a sad baby, or a sleeping baby. While some are applied for the sake of putting the baby close to the life of the parent, others have different meanings. There are some that will be used as a form of appreciating the beauty of art. This is most common with the babies that are drawn while playing or with other items around them.